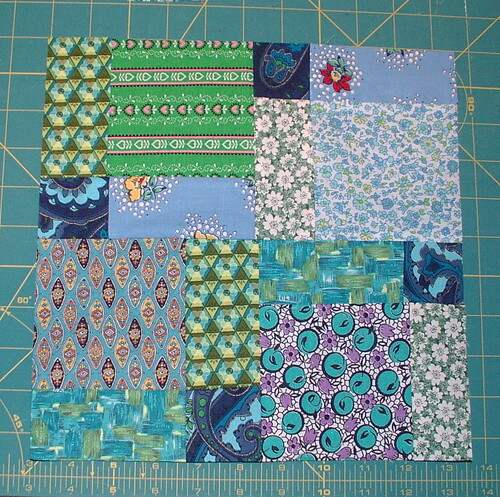 Cut 9 squares 4 1/4 inches square. 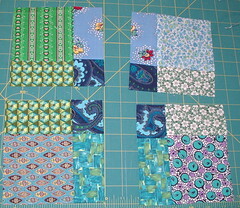 Lay-out for placement; flip middle column on top of left column. 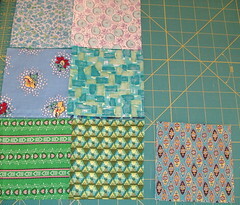 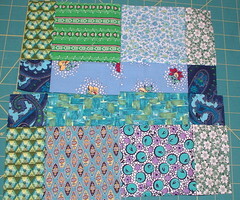 Stack with bottom-most row on bottom of stack; take to machine to sew. 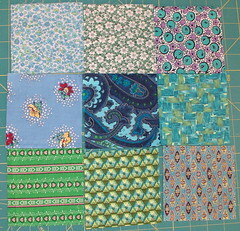 Sew these in the continuous chain method that was demonstrated in the block of the month tutorial for Aug.
Take your chain back to your layout table and open up. 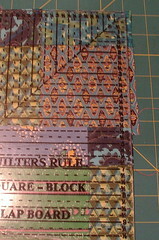 Lay right-most column on top of middle column and chain stitch. 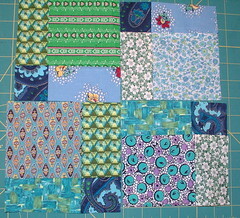 Again, do not cut any of your chain stitching. 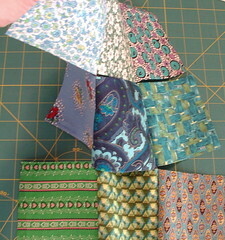 Press seams in opposite directions from row to row so they will nest when sewing the next set of seams. 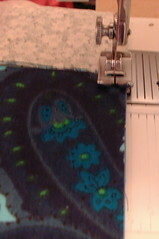 Take this piece of half-sewn cloth to the machine and sew the next two seams and press again. 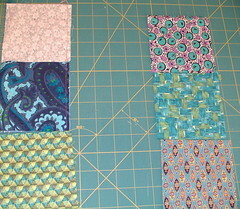 Take back to cutting board; true up and cut in half, both directions. 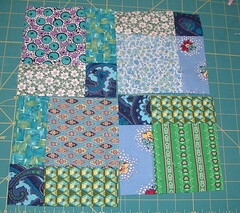 Play with placement of blocks. 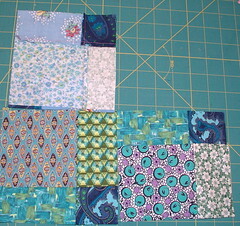 Once you find the lay out you want, flip right sides together like in step number 2. 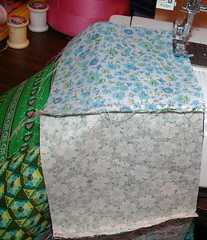 Sew last two seams, press in between the sewing of the first and second seam. 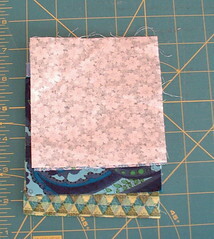 Press and true up again to 10 1/2 inches. 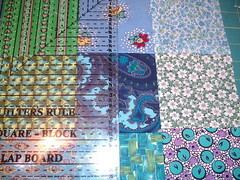 Thank you so much for this tutorial--it helps enormously. 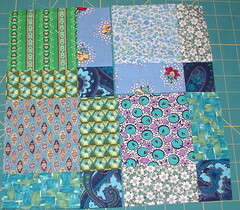 I've been wanting to make some patchwork bags for the fun and challenge of it but really wasn't sure where to begin and how to proceed. 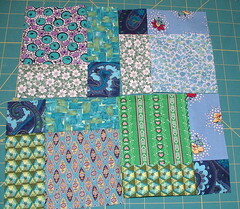 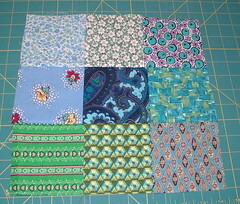 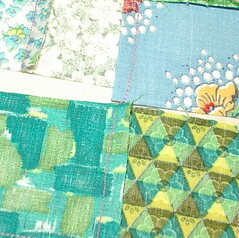 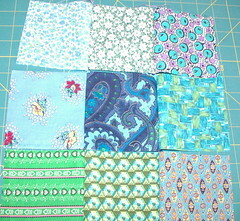 So far, my patchwork efforts have been potholders and pincushions. 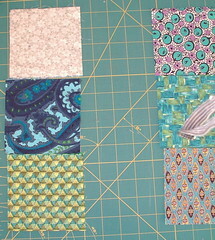 Obviously, I have much to learn.